A Chuppah is a Jewish marriage canopy. 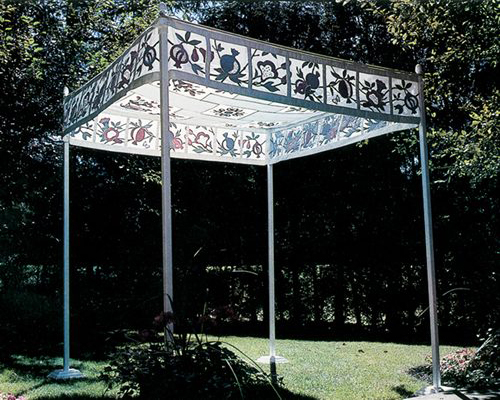 The Pomegranate Chuppah was designed by Sarah Silver and completed in 1991 as a Guild project. The technique is shadow quilting; felt designs are sandwiched between pieces of sheer silk organza. The designs are outline quilted with silver thread and highlighted with beads. The designs are images of pomegranates in their various stages of development. The Chuppah was donated to Baycrest Centre.